HomeProducts FolkArt ® Stencil Value Packs - Modern Variety, 12" x 12"
The 26-piece Modern Variety FolkArt Stencil Value Pack contains 12" x 12" stencils featuring 66 designs, ideal for adding a touch of personality to your home decor. The 26-piece Modern Variety FolkArt Stencil Value Pack contains 12" x 12" stencils featuring 66 designs, ideal for adding a touch of personality to your home decor. Pair with other FolkArt stencils to created layered and dimensional designs. Use these 12" x 12" stencils to embellish furniture or create an eye-catching art project. 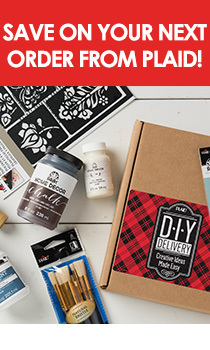 Great for use with your favorite Plaid paint—from FolkArt to Apple Barrel. These durable stencils are reusable and can be cleaned up easily with a baby wipe and paper towel. Let dry and store flat.